Homework assignment: On the simplest level, the synthesis matrix can be used to assess student ability to find appropriate references and extract relevant information from those references. An example of this is described above for FYS and I can easily see this working well in Introductory Biology classes. I have also done this in Molecular Pathophysiology (Biology 433) as a homework assignment prior to assigning a literature review writing assignment. Classroom Activity: In Physiology (Biology 333), I have lab groups (6 groups of 4 students each) find a primary publication on a topic related to an upcoming lab project and analyze it for specific information related to research methods and results. In order to avoid overlap and make sure they found the right type of paper, I have the students email the paper they found for approval. If two groups found the same paper or if it is not the right type of source (for example, some students will try to use a review), I will ask them to find another paper. In lab I draw a synthesis matrix on the board and distribute blank handouts of the same synthesis matrix. We then go around the room and as students report their findings, I fill in the synthesis matrix. When it is done, I demonstrate how to use the matrix to synthesize the results of multiple references to come to overarching conclusions and design new experiments. We use this to guide the design of a class research project and in future writing assignments. 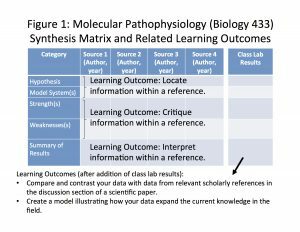 Model Creation: The most complex way I have used the synthesis matrix is in Molecular Pathophysiology (Biology 433). As a research based Writing in the Discipline (WID) class, we focus all of our attention on analyzing primary literature and doing novel experiments in lab. Throughout the semester, I encourage students to draw their own textbook style models of what data show. 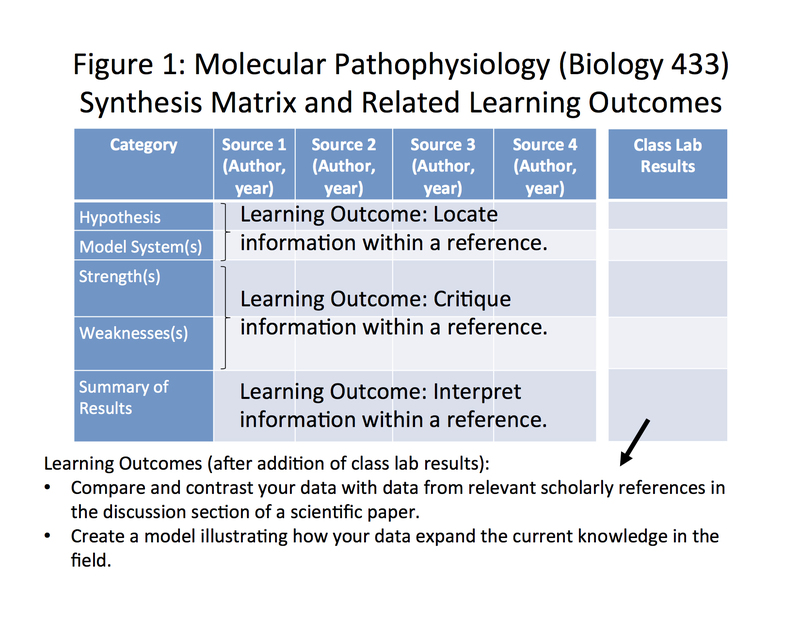 This can be done by synthesizing results from a single primary publication (if the authors did not already generate a model), multiple primary publications (as seen in review articles), and even by incorporating student lab results with published results. The synthesis matrix can be set up to accommodate all of these approaches. For example, instead of labeling columns by reference #, columns can be labeled by figure # for a single primary publication. Similarly, a column for class lab results can be added to incorporate class results (Figure 1). This is my favorite way of using the matrix. It is so powerful for students to see how one small experiment they did fits in with the big picture of what others have published. Of all the teaching methods I have tried over the years, the synthesis matrix is the closest I have come to teaching students how to think like an expert. It has also allowed me to do a better job of breaking the research and writing process down into component parts. If you tell a college senior to write a one page introduction section of a scientific paper with 5 references, many of them think they can produce one page of writing in a couple of hours (I know I thought that as a senior in college!). However, if you force them to do a synthesis matrix that includes analysis of the relevant information in 5 primary papers prior to writing about them, they quickly realize how much work is involved. Ultimately, the most important lesson I learned though all of this is that teaching in science classes can benefit greatly from methods used in classes outside of our discipline. If you Google “synthesis matrix”, it is a commonly used method promoted on Library, Academic Coaching, and Writing Center websites at many colleges and universities (3, 4, 5). However, I never heard of it until librarians introduced me to it while teaching FYS. Interacting with scholars outside of my discipline has helped me to integrate the teaching of higher level learning goals alongside lower level learning goals related to content in my classes. Vanderbilt University, Center for Teaching, Bloom’s Taxonomy. 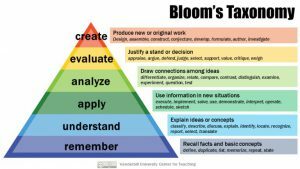 https://cft.vanderbilt.edu/guides-sub-pages/blooms-taxonomy/. 2018 Vanderbilt University, Accessed December 28, 2018. Dickinson, First-Year Seminar. https://www.dickinson.edu/homepage/99/first_year_seminars . Accessed December 28, 2018. Ashford University, Synthesis Matrix. https://writingcenter.ashford.edu/synthesis-matrix . 2017 Bridgepoint Education. Accessed December 28, 2018. Johns Hopkins Sheridan Libraries, Write a Literature Review. http://guides.library.jhu.edu/lit-review/synthesize . 2017 Johns Hopkins Sheridan Libraries. Accessed December 28, 2018. Academic Coaching and Writing, A Synthesis Matrix as a Tool for Analyzing and Synthesizing Prior Research. https://academiccoachingandwriting.org/dissertation-doctor/dissertation-doctor-blog/iii-a-synthesis-matrix-as-a-tool-for-analyzing-and-synthesizing-prior-resea . 2018 Academic Coaching and Writing LLC. Accessed December 28, 2018. 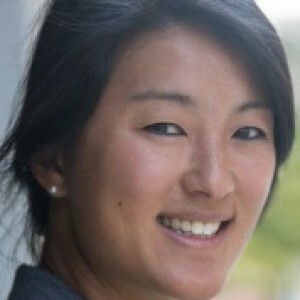 Tiffany Frey is an Assistant Professor of Biology at Dickinson College in Carlisle, PA. She received her Ph.D. in Molecular Medicine from Johns Hopkins University School of Medicine and also has a certificate in Adult Learning from Johns Hopkins University School of Education. She teaches Introductory Biology, Physiology, and Molecular Pathophysiology at Dickinson College. 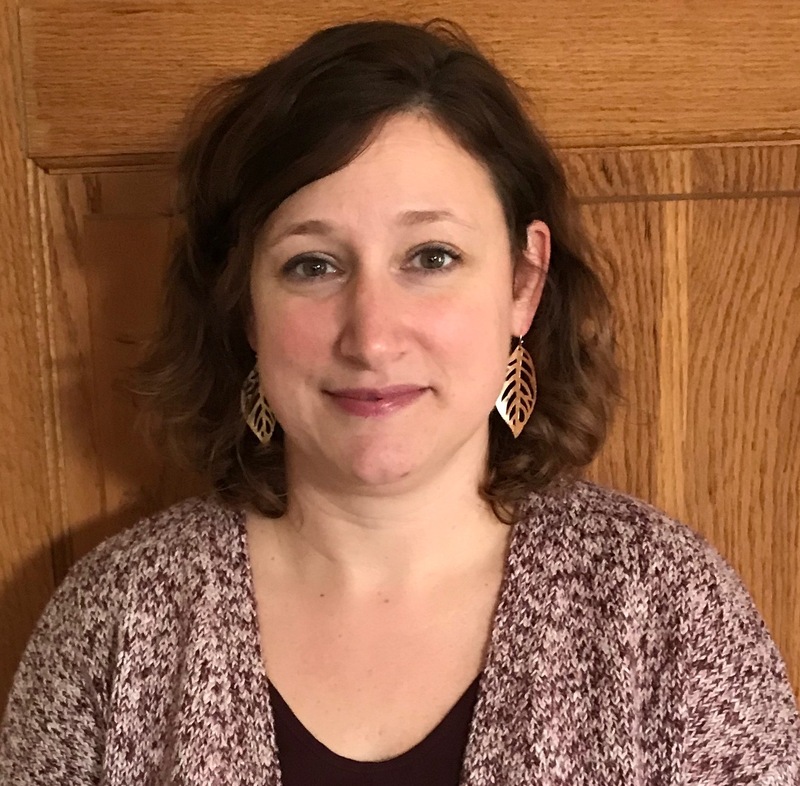 Her research interests are focused on understanding the cellular and molecular basis of autoinflammatory disease and incorporating and assessing the effects of scholarly teaching methods in her courses. 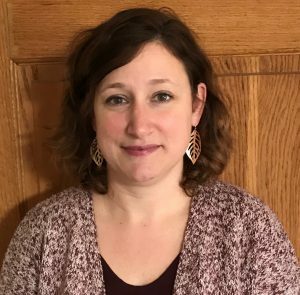 Outside of work, she enjoys spending time with her family (husband, 2 children, and dog Charlie), reading, participating in exercise classes, and running in local races.